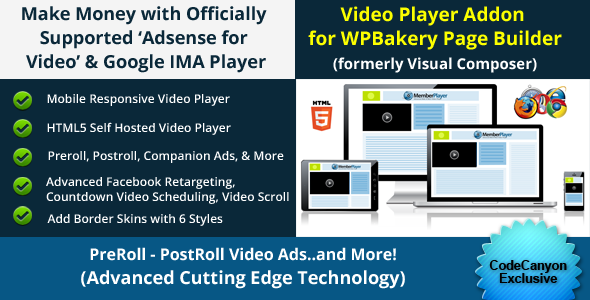 HTML5 Supported Google IMA & Doubleclick with Adsense for Video Preroll/Postroll Video tags. See all the features by clicking on preview. (2) Add Any HTML Overlay over your video, including buy buttons, optin forms, banners, WP Shortcode, and more. Special Features include Facebook Retargeting, Dimmer Lightbox Effect, Video Scroll Display, and Timer Countdowns in Video included. See full demo’s by visiting salespage.